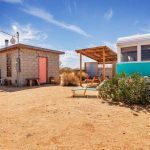 Ideal for the festival set, this tiny cabin nestled into the desert landscape of Joshua Tree, CA, is now on the market for $199,000. The funky vacation getaway includes three structures on the property: the cabin, a trailer known as a “canned ham,” and two shipping containers that serve as hangout space on the private 5 acres. There was a catch to snagging a parcel for a rock-bottom price. Buyers had to agree to put up a minimum structure, or “homestead,” on their land. When the previous owner bought the property, the cabin had actually never been used. And it’s no wonder. It had no kitchen, no bathroom, and no bedroom. So a small kitchen and sitting area with a wood-burning stove were added to the 192-square-foot space. A cozy adjacent trailer includes the bedroom and bathroom, as well as an outdoor shower. Just about 10 miles from the park entrance, it’s an easy drive to the few restaurants and cafes that have opened up. Larger chain stores can be found about an hour away in Palm Springs. Plus, it’s a little over an hour away from the Empire Polo Club in Indio, where the annual Coachella festival takes place. Or, you don’t have to leave at all. Simply walk outside and bask in the eerily beautiful desert landscape.